Red Tail Reborn Special Edition DVD (Two DVD Discs). The ambition to make these heroes a household name is the primary objective of the Red Tail Project, a group of men and women who honored the Airmen by touring airshows with a restored P-51C Mustang, the famous roaring fighter plane these men flew in combat. 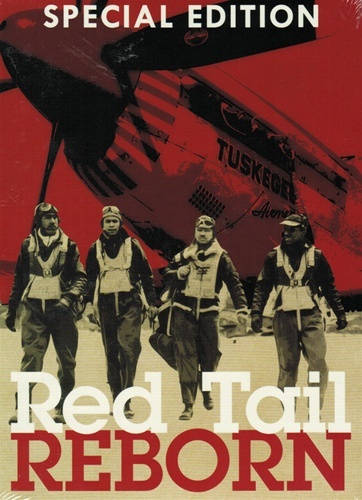 The Red Tail Project is part of the CAF, or Commemorative Air Force; a nationwide organization dedicated to preserving WWII aircraft. Like the men they tribute, the Red Tail Project encountered adversity when flying homage to the Airmen, the Mustang, crashed in 2004, killing pilot Don Hinz, who was also the project leader. 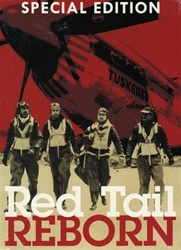 The Emmy Award winning Red Tail Reborn, narrated by Michael Dorn, is a tale of inspiration. Historic interviews, unprecedented access, and emotional honesty bring to light the tale of the Airmen and of those who honor them. The Tuskegee Airmen showed the world what hope, determination, and hard work could do. Find out how these lessons are applied to a project recovering from a lost aircraft and a lost friend. Commentary on this DVD from Col. Frank Borman - Commander, Apollo 8: The program is outstanding and long overdue. These gentlemen are real heroes! I enjoyed every minute of both DVDs! In NTSC DVD format and region-free with a runtime of about 58 minutes.